October is National Popcorn Poppin' Month, and there's no better way to celebrate than with everyone's favorite snack! Celebrate with The Little Kernel "Miniature Popcorn", one of the market's smallest popcorn brands. With a unique, hulless, "miniature kernel," The Little Kernel is popped in 100% PURE olive oil, and is gluten-free, non-GMO, dairy-free, kosher, and certified whole grain. The Little Kernel is available in six delicious flavors, including: Truffle Sea Salt, Sweet & Salty, Pink Himalayan Salt, White Cheddar, Butter and Naked (No Salt Added). I always have snacks on hand at my house. The teens raid my pantry each day like the apocalypse is near. 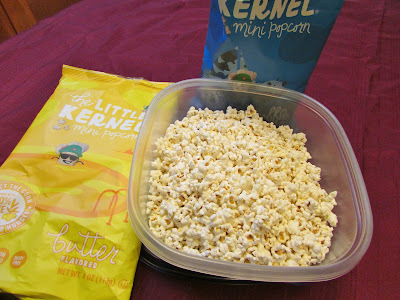 One of our fave snacks is popcorn, and The Little Kernel miniature popcorn has been a bit hit at the house. The popcorn is smaller than regular popcorn, but looks the same otherwise. The flavors are delicious, and it tastes fresh. Which flavor of The Little Kernel would you most want to try? They all sound good but I would try the sweet and salty first. It is so nice that companies are making the effort it takes to make food products that people with allergies and other health issues can still enjoy. I am glad these are whole grain. This popcorn does sound amazing, and no hulls, either, and nice options!